Here's a little Visual Studio web development tip that I've been using lately. 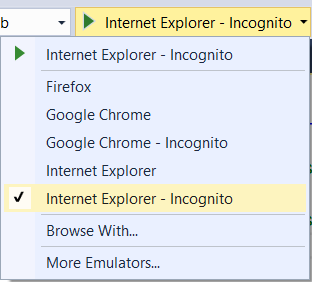 You know how Visual Studio picks up your installed browsers and has them available as a dropdown list? 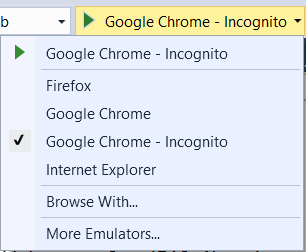 I found it very useful when debugging to add Google Chrome's Incognito Mode as a browser of its own. 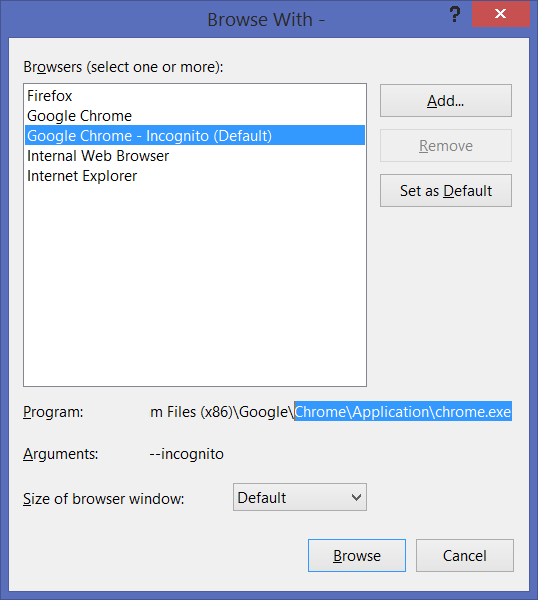 Then add --incognito as command line switch and name the browser something like "Google Chrome - Incognito." You can do the same thing with Firefox and Internet Explorer. Here I'm adding Internet Explorer with the -private option. This is a useful thing for developers if you're doing anything with cookies or caching and you've found yourself clearing the cache or browser history a lot. Question for you dear Reader - Is this a feature you would want by default? Would you want not just every browser added, but also the Private Mode for each as well? I think having this as default would be cool, but I also love how simple it is to add them as browsers as well. 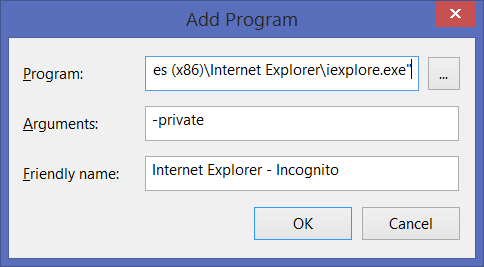 Yes, I think it'd be very useful to launch browsers in incognito/private mode as an option in Visual Studio. That would be nice! I have never think of it before. This is great, thanks! Yes, I use incognito all the time for development, not just because of cache/history, but also to have a plug-in free development environment. They can really get in the way sometimes, especially my password manager always trying to save my dummy test account passwords! Having it built in would be nice, but not such a big deal now that you've showed us how easy it is to add it ourselves. Thanks! I'd definitely like to see this as default. I've previously tried to add IE using the -private flag, it works fine, until you close VS (2013 Community), then it always launches in normal mode after that. Chrome seems to work though. For Firefox it should be "firefox.exe -private-window". Yes, but I now know to do this for myself, and I'm happy to do it. In Chrome DevTools, there is a setting "Disable cache (while DevTools is open)". I find that option suits my needs just fine. I rarely don't want to store cookies/local storage while developing. Would definitely want this is a feature out of the box! Nice post. With recently testing authentication with Azure Active Directory I found it necessary to use Icognito so that my windows live cached credentials don't interfere with the AAD domain that I am using/testing with. Shipping with these would be a nice touch. Even better if it became a built-in option in v.next. would be nice to have it by default. Thanks for the nice tip. Yep, having this by default would be lovely. If at all it is wanted, Google Chrome should always be run with DropMyRights.exe - from another MS employee. Still runs apps with lesser privilegs than the default lower privileges of Windows Vista/7/8. Definitely yes, having private mode by default is better than adding it manually. There is no much difference for single machine, but when it comes to teaching newbies and dealing with development VMs - that's reasonable. Definitely would love to have this out of the box! Thank you for the great tip Scott. Would be nice to have it by default. This is a great tip too! Very good feature, but who clicks F5 to debug a real website to do manual testing? I'd rather not have the default menu laden with options; the option to change the content of the menu is right there with the items. Don't overfill our UI with stuff we can easily add ourselves! When debugging "--disable-web-security" is another useful command line switch in Chrome to disable same origin policy. Yes please, that would be brilliant! Yes! We'd love this feature. And thanks for the tip! Better options to devs who deal with lot of cookies and caching. I am using VS 2015 and the dropdown only has installed browsers with no option to add more. Does anyone know how to do this in VS 2015?